Daffodils are one of the heralds of spring, but once they bloom, the long green foliage droops, becomes unattractive and even blocks the sun from later emerging flowers. However, you should never cut the foliage back. The leaves continue to feed the bulb and strengthen it for next year's bloom. So, what's a gardener to do? 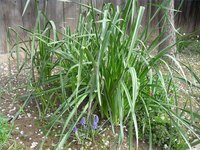 An easy way to tidy up the yard without depriving your daffodil bulbs of nutrition is by 'hay-stacking' the daffodil foliage. This technique works on any bulb in the narcissus family. Take a group of between twelve and twenty daffodil leaves, depending on the thickness of each leaf, and comb them straight. Don't grab too many at a time or the group will not bend easily and may later break loose. Fold the remaining leaves a third of the way down and then fold them another third. Your bundle should be 'hay-stacked' and a third as long as it was originally. Wrap the two free leaves around the bundle and secure the ends. Repeat with the remaining plants. Don't pull the leaves too tightly to secure them or the leaves may break and you'll have to start over.